Archaeology in the Classroom is designed to bring interactive archaeology programs to students of all ages. The study of archaeology can be used as a pathway to teach students about science, math, social studies, literature, and our shared cultural heritage. An Archaeology in the Classroom program includes a brief overview of what archaeologists do, what archaeology is, and hands-on activities to reinforce archaeological concepts. The Archaeology in the Classroom experience can be custom tailored to each class in order to deliver a presentation that meets your students’ needs and interests. Please contact SCAPOD for current prices, and to learn more about Archaeology in the Classroom programming for your school. Writing supplies such as pencils, ballpoint pens, and even commercially made ink were not always available to people of the past. Sometimes ink needed to be made with whatever was on hand. 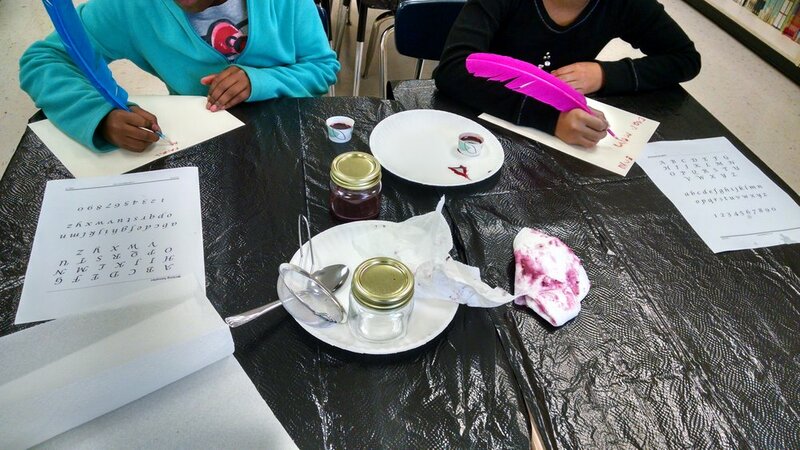 In this colonial-era activity, students learn to make ink out of berries, salt and vinegar. Students then have the chance to write or draw with their newly-made ink using feather quills. People have been playing games for thousands of years. We will explore the evolution of games from prehistoric into historic and modern times. Students will play early 20th century parlor games, as well as some prehistoric Native American games. Students will also make a ring and pin game to take home. This activity allows participants to create their own pottery using air-drying clay following a lesson on prehistoric and historic pottery types. Participants will be given the freedom to express their creativity in this activity by designing a pot they will be proud to take home. Pottery tools (i.e., coil paddles, carved paddles, bamboo) will be provided to assist participants in their pottery designs. This activity is designed to help participants express themselves through visual symbolism. Each participant will use air-drying clay to make a clay gorget that says something about himself/herself. Student can then take their gorgets home. This activity is designed to help participants learn about techniques used by archaeologists in the lab. They will decorate small ceramic pots (one per participant), then drop them to re-create the numerous pieces archaeologists usually find in the ground. Using glue and puzzle power they reassemble their pots to take home. Participants in this activity will learn about the concept of stratigraphy, or the geological layers in the soil. Following the directions given in a narrative that illustrates how archaeological sites are made, participants will create their own archaeological site using a clear plastic jar, colored sand, and small “artifacts”. Participants can then take their archaeological sites home to enjoy and describe to their families! 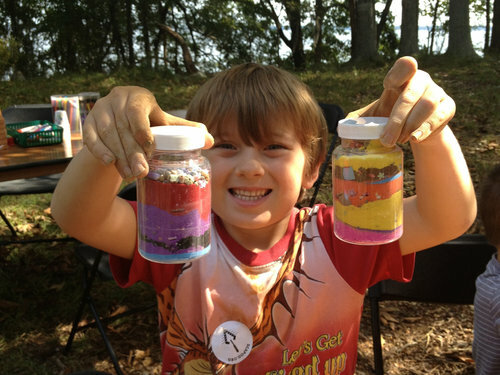 This activity is based on the book Discovering South Carolina’s Rock Art by Tommy Charles (2010). Students will learn what the term symbolism means within Anthropology. They will then conduct two activities to explore what symbolism means to them. Students will work as a class to draw pictographs on a Rock Art Wall (a long piece of butcher paper that is left with the teacher for display). Students will also carve petroglyphs on pieces of air dry clay they can take home. Participants will learn about the types of buildings Native Americans constructed, and the resources they used in South Carolina to complete the process. Wattle and daub huts were one form of shelter used by people native to the South Carolina region. Participants will construct model wattle and daub huts using both building materials found in South Carolina’s natural environment and modern materials. Looking for a free archaeology-related activity to do in your classroom? Check out our Lesson Plans!